Congratulations to senior Mary Nelson, who has been selected as this year's St. Louis Post-Dispatch Scholar Athlete from DB! 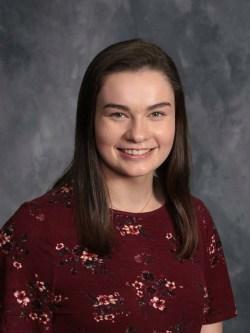 Throughout her four years, Mary has earned a place on the First Honor Roll each semester and was part of the Academic All-State Volleyball Team (2015-2018) and Academic All-State Basketball Team (2016-2019). She also received DB's Scholar Athlete Award for basketball during the 2017-18 season. On the court, Mary led her basketball and volleyball teams as team captain for three years each. In basketball, she earned First Team All-Conference honors and Second Team All-Conference honors at the Valley Park Tournament; she was also named the Raising Cane's Athlete of the Month in 2019. As a volleyball player, she earned First Team All-Conference, Second Team All-Conference, First Team All-District and Second Team-All District honors over the years. Look for Mary's profile alongside other high school Scholar Athletes in the Post-Dispatch and stltoday.com on May 9!